Find out more useful information to help you progress on the guitar, whether you are a completely beginner guitarists or advanced. Acoustic or Electric. All are welcome. Playing the guitar is a tonne of fun, yet there are lots of people who give up, who never become good. We are going to look at a few tips and tricks to help you to becoming a better guitar player. Is playing the guitar definitely something you want to do? Playing the guitar isn’t the easiest of instruments. In fact, it can actually be really hard at first. Which is why it’s really important to have persistence for your guitar playing. When it gets tough, you mustn’t give up. Because the only difference between people can play the guitar and those who can’t is that the people who can never give up. Your effort that you put into the guitar will directly translate to the amount of result that you get. If you put in massive amount of action in a short space of time. You will see that reflected in your guitar playing. However, in the initial stages. It does take a little while for your brain to adjust and learn how to coordinate with your fingers. This will be easier for some than others because different people’s coordination ability is different. Over time and with practice, everyone can improve and learn to play the guitar. So just do it, and keep going and you will get there. A lot of guitar players learn how to play from YouTube videos or watching their favourite guitar players. Did you know that not all of them have good posture? In fact, a big majority of them do not. What does this mean for you? If you learn to sit in a posture that is not ideal for you, you can struggle with technique problems later down the line. And the worse thing is having pain in your back and shoulders. I'm going to outline how to sit with your guitar to that you can enjoy playing it without pain in the future. On top of that, also making sure that you don’t ever hit a brick wall with your technique. Yes, the way we show you to sit with your guitar may not look very cool. The most common way that guitarists hold their guitar nowadays does look more rock and roll. (Which means having their guitar on their right leg for most people.) We want you to save that for your music videos. When you are practising, the best thing to for your posture is to have your guitar on your fretting leg. (Left leg for most people.) Tilt your guitar so it’s in the same position as it would be if you were standing up. Once you’ve got it in that position, you will realise that now this guitar positioning is similar to when you are standing up with your guitar. So practising this way means you only have to learn to play in one position for both hands! Therefore, you need less practise time for you to make more progress. To maintain this position, use a guitar strap or footstool. If your guitar is heavy, definitely keep both options open, so that you can change between the two when your guitar gets too heavy for your back, or you start getting pins and needles in your leg. Having the correct positioning will save you from a backache, neck ache, shoulder pain, wrist pain. On top of that, reduce the possibility of incorrect technique holding you back from playing at an advanced level. I think all of that is worth it for sitting in a more “classical” position. Keep a look out for Part 2 to find out more about other guitar tricks to help you advance as a guitar player! Hope this guide and the videos have helped you understand a couple of key pieces of information in regards to your playing. If you are a beginner guitar player struggling to make progress and you are based in London, England. Then we would love to hear from you. We are here to help you get fast results on the guitar the fun way and want to find out how we can assist you with your specific goals. Fill in our contact form below, and we look forward to hearing from you. 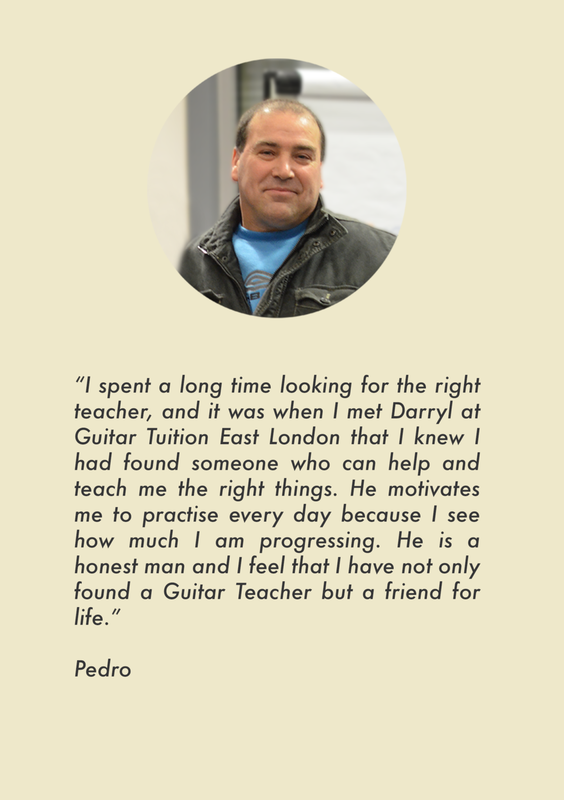 Electric and Acoustic Guitar Lessons for Adults and Kids in East London. Free Introductory guitar lesson to find out how we can help you. We are here to get you the result you are looking for! Guitar Lessons London Location. We provide Acoustic Guitar and Electric Guitar Lessons East London. Situated in East Village, Stratford, in Newham county. We are near Bethnal Green, Shoreditch, Aldgate, Hackney, Bow, Mile's End, Wanstead. Canary Wharf, Isle of Dogs, Leytonstone, Leyton. Train to Stratford is only 8 minutes from Liverpool Street and 10 minutes away from King's Cross.